Ipe boards look somewhat like Teak without Teaks distinctive odor. Ipe is actually superior in deck applications. Ipe heartwood is typically reddish brown often with light or darker striping cunning through its grain. Ipe is typically available in longer lengths with limited twist and warp. Consumers need to purchase Ipe from a reputable source. 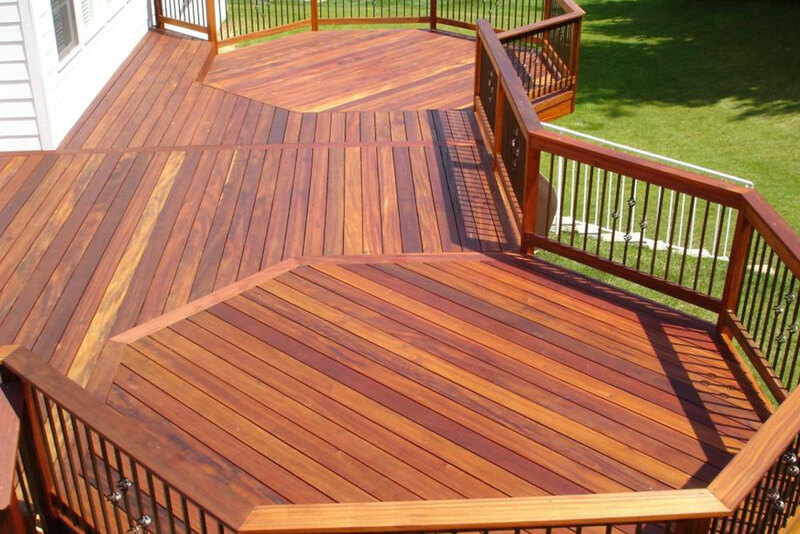 It is the wood of choice for residential decks. In addition to its hard surface Ipe is naturally resistant to rot, decay and attack from insects. It is popular not only in North America but also in Europe and Asia. Ipe has other amazing qualities including the fact that it is 3 times harder than Oak. Ipe in fact is so dense it sinks in water. It has a Class A1 Fire Rating, the same as concrete and steel. A new Ipe deck is resistant to preservation treatment due to its hard surface. Ipe can be easily cleaned with a pressure washer and lightly coated with tropical deck finishes to maintain its natural appearance. With IBAMA in control Brazil now requires tree harvest certifications to accompany all lumber from standing trees in Brazil to warehouses in the U.S. Certifications must accompany lumber at all times with the risk of confiscations and penalties for non-compliance. Loggers must acquire harvest certifications which allow them to harvest limited trees from specified areas. Certification documentation are all tracked with GPS’s. Ipe boards look somewhat like Teak without Teaks distinctive odor. Ipe is actually superior in deck applications. Ipe heartwood is typically reddish brown often with light or darker striping cunning through its grain. Ipe is typically available in longer lengths with limited twist and warp. Consumers need to purchase Ipe from a reputable source. It is the wood of choice for residential decks. In addition to its hard surface Ipe is naturally resistant to rot, decay and attack from insects. It is popular not only in North America but also in Europe and Asia. Ipe has other amazing qualities including the fact that it is 3 times harder than Oak. Ipe in fact is so dense it sinks in water. It has a Class A1 Fire Rating, the same as concrete and steel. A new Ipe deck is resistant to preservation treatment due to its hard surface. Ipe can be easily cleaned with a pressure washer and lightly coated with tropical deck finishes to maintain its natural appearance. With IBAMA in control Brazil now requires tree harvest certifications to accompany all lumber from standing trees in Brazil to warehouses in the U.S. Certifications must accompany lumber at all times with the risk of confiscations and penalties for non-compliance. Loggers must acquire harvest certifications which allow them to harvest limited trees from specified areas. Certification documentation are all tracked with GPS’s. [WD_GALLERY id=835] Ipe boards look somewhat like Teak without Teaks distinctive odor. Ipe is actually superior in deck applications. Ipe heartwood is typically reddish brown often with light or darker striping cunning through its grain. Ipe is typically available in longer lengths with limited twist and warp. Consumers need to purchase Ipe from a reputable source. It is the wood of choice for residential decks. In addition to its hard surface Ipe is naturally resistant to rot, decay and attack from insects. It is popular not only in North America but also in Europe and Asia. Ipe has other amazing qualities including the fact that it is 3 times harder than Oak. Ipe in fact is so dense it sinks in water. It has a Class A1 Fire Rating, the same as concrete and steel. A new Ipe deck is resistant to preservation treatment due to its hard surface. Ipe can be easily cleaned with a pressure washer and lightly coated with tropical deck finishes to maintain its natural appearance. With IBAMA in control Brazil now requires tree harvest certifications to accompany all lumber from standing trees in Brazil to warehouses in the U.S. Certifications must accompany lumber at all times with the risk of confiscations and penalties for non-compliance. Loggers must acquire harvest certifications which allow them to harvest limited trees from specified areas. Certification documentation are all tracked with GPS’s.